Improper installation of rims and wheels on a vehicle is a major cause of tire, rim and wheel problems. This will ultimately result in down-time for your fleet but also pose safety concerns. Proper torque at installation and re-torque after the “seat in” period is essential for safe and reliable normal wear. 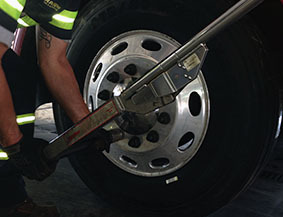 Raben Tire truck technicians use the finest equipment and possess the proper training. We hand torque all wheel assemblies to ensure the exact foot pounds of torque is applied, reducing over or under torquing conditions, and we follow all procedures and safety instructions in accordance with manufacturer’s recommendations. Even new equipment being placed into service will experience a “seat in” period. This may cause a loss of clamping force. Just as it is imperative to torque all wheels to ensure proper clamping force is in place as the vehicle goes into service, it is proven as important to re-torque after that “seat in” period. Industry recommendation is within 100 miles.